3. Who Do You Want to Pay: Type in the remita account details of the school. 12. A capcha code will be shown: Type exactly what is shown and click on: Proceed to Payment. With internet banking, you can transfer money directly from your account to the beneficiary via Remita powered transfer. Most Nigerian Banks now have their banking apps that allows users to make transfer just on the go. Please note that they may be a fee attached to this transfer. 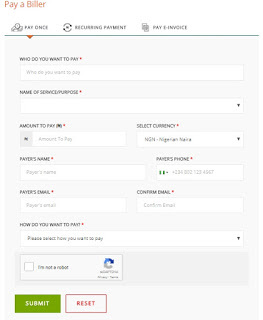 On that “Pay with Internet banking”column, you will see the icons of banks that supports internet banking on Remita platform. Click on any one of your choice and proceed to payment. If you want to pay the money at any bank branch, simply print the transaction receipt or copy the RRR code to your bank and pay the required amount. You can also pay using your ATM card. Simply click of the card of your choice e.g. Nigerian cards: MasterCard, Visa, Verve or International Card: MasterCard, Visa. You can also pay via e-Wallet services such as PocketMONI. You are done. After successful payment, you will be able to download the payment receipt for subsequent accreditation with your establishment of partner.